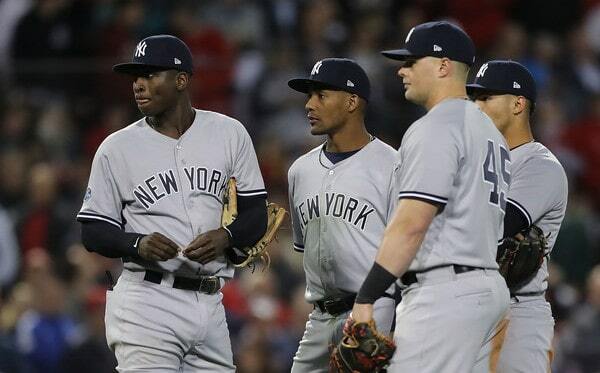 The Yankees went to Fenway Park and did what they had to do over the weekend. They split the first two games of the ALDS and grabbed homefield advantage. Game Two was especially fun. 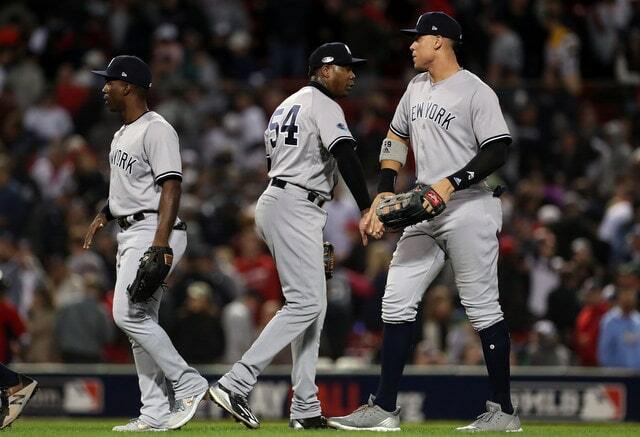 The Yankees socked some dingers and, after the game, Aaron Judge blasted “New York, New York” from his road trip boombox as he walked through the Fenway Park concourse to the team bus. Pretty great. Anyway, I have some thoughts going into Game Three tonight (7:40pm ET on TBS), so let’s get to ’em. 1. Remember how bad Judge was in the ALDS last year? He was historically awful. He went 1-for-20 (.050) with a double, four walks, and 16 strikeouts (!) in the five-game series against the Indians. That’s the most strikeouts by a single player in a postseason series in baseball history, including seven-game series. Judge was much better in the ALCS against the Astros (.250/.357/.708) and, this postseason, he’s been a monster. He is 7-for-12 (.583) thus far, and in all three postseason games he’s hit a home run and reached base three times. Judge is 12-for-29 (.414) with five walks (.500 OBP) and six homers (1.138 SLG) in his last eight postseason games dating back to ALCS Game Three last year. What a beast. Hard to believe we were all concerned about whether Judge would have his timing at the plate and adequate strength in his wrist after the injury. It wasn’t unreasonable to be concerned! Wrist injuries are tricky. Right now, it’s impossible to tell he was ever hurt. Judge had three 109+ mph batted balls in his first three at-bats in Game Two. MVP candidate Jose Ramirez had two 109+ mph batted balls all season. Judge is a unicorn, man. That size, that athleticism, that power, that leadership. He’s looking more and more like a once in a generation type, truly. 2. The talent and depth in the bullpen is insane. The guys the Red Sox have been trotting out there in middle relief do not compare to the guys the Yankees have been running out there. The depth has really stood out. The Yankees used four relievers to cover five innings in the Wild Card Game and they still had Chad Green and Jonathan Holder in reserve. Four relievers covered six innings in ALDS Game One and the Yankees didn’t use Aroldis Chapman, Dellin Betances, or Holder. Three relievers covered four innings in ALDS Game Two and the Yankees had David Robertson, Green, and Holder still available. That is nuts. Holder threw 66 innings with a 3.14 ERA (3.04 FIP) this season and was a rock solid middle innings reliever, and he hasn’t even warmed up in any of the three postseason games. When that dude is your sixth best reliever, you’re in great shape. The bullpen is incredibly deep and the built-in rest means the Yankees will have all those guys available pretty much every game. There are no A.J. Coles who need to soak up innings when others need rest, you know? The relievers still have to get outs, absolutely, but what an advantage the bullpen has been thus far. They protect leads and, when the Yankees are behind, they prevent the other team from adding on. 3. Eduardo Nunez, not Rafael Devers, has started at third base in the first two games of the ALDS, and Red Sox manager Alex Cora said it is because “we feel he’s been the better defensive player.” First and foremost, I’m pretty sure this is the first time anyone has said Nunez is in the starting lineup for his glove. Hard to believe. Secondly, there’s a parallel to the Gary Sanchez/Austin Romine situation here. Devers is, clearly, the more talented player and more likely to do something game-changing (at the plate). Nunez is the safer play. Neither he nor Devers stood out for his bat during the regular season (90 wRC+ vs. 78 wRC+), and the Red Sox consider Nunez the superior defender, so they’ve have gone with him. The Yankees are doing the opposite. Romine is the better defender than Sanchez — well, he’s better at blocking pitches in the dirt, throwing and pitch-framing and game-calling are a different matter — and the safe play would’ve been to start him in the postseason. Instead, the Yankees have stuck with Sanchez, and he rewarded them with a monster two-homer game in Game Two. Nunez is 0-for-7 with a walk in the two ALDS games and his defense has been suspect as well. The Red Sox have played it safe and they have yet to be rewarded. The Yankees bet on the talent and it paid huge dividends in Game Two. 4. This isn’t the easiest thing to quantify, but the Yankees seem to be positioned exceptionally well this postseason. Ground balls are hit right at guys and the outfielders aren’t having to travel very far to run down fly balls. The Red Sox had several hard-hit balls against Masahiro Tanaka the other night and Brett Gardner was in position to catch all of them. Don’t mistake that for me saying the Yankees have been flawless defensively. Miguel Andujar still has his issues and Luke Voit can make things interesting at first base. I’m just saying that the Yankees seem to have their defenders positioned very well. Ground balls have been hit right at infielders and several line drives have been hit right at defenders at well. Maybe it’s all one giant coincidence. That’s possible. Given how much the Yankees rely on analytics though, I don’t think that’s the case. Love it or hate it, the shift is here to stay, and the Yankees have doing a really good job getting their people in the right spots. 5. Obvious statement is obvious: The Yankees don’t want this series going back to Fenway Park for Game Five, especially not with Chris Sale lined up for that game. If they have to do it, they have to do it, but they want to put this series away these next two days. The Yankees are built for their ballpark and the Yankee Stadium crowd is a very real homefield advantage. Astros players said the atmosphere was intimidating last season — “There’s no doubt the crowd had an effect on the game,” said then Astros DH Carlos Beltran to Tom Verducci following the ALCS Game Four comeback last year — and I imagine the energy with be ratcheted up another notch since this is Yankees vs. Red Sox. The Yankees are undefeated at home since last postseason. They won all six home games last year and the Wild Card Game this year. That’s because the Yankees are insanely talented and built for their ballpark, first and foremost. But the crowd helps. For sure. The old Yankee Stadium was special in its own way. I loved that place. I grew up going to games there. The new Yankee Stadium has started to develop its own personality though. Its own personality with a new core of players. The Yankees have transitioned out of the Derek Jeter era and a new core has arrived. It’s fun and it’s exciting, and the atmosphere at Yankee Stadium reflects that. I get the feeling these next two games will be bonkers. The ALDS is now a best-of-three series with the next two games at Yankee Stadium. I can’t shake the feeling that the Yankees should be taking a 2-0 series lead back to New York, but there’s nothing anyone can do about that now. Splitting the first two games at Fenway Park is a-okay with me. The Yankees picked up a 6-2 win in ALDS Game Two on Saturday. For the Yankees, that is. Including ALDS Game Two, David Price has made five starts against the Yankees this season, and in those five starts he allowed 23 runs and eleven home runs in 17.1 innings. That includes a six-inning, two-run start back in August! Goodness. Price didn’t make it out of the second inning Saturday. It’s a damn shame Alex Cora is a smart manager with a quick hook. The Yankees got on the board quickly thanks to Aaron Judge’s third home run in three postseason games. He hit a two-run home run against Liam Hendriks in the Wild Card Game and a solo home run against Craig Kimbrel in ALDS Game One. In Game Two, it was another solo shot, clear over the Green Monster to center-ish field. Look at that photo above. It is perfect. 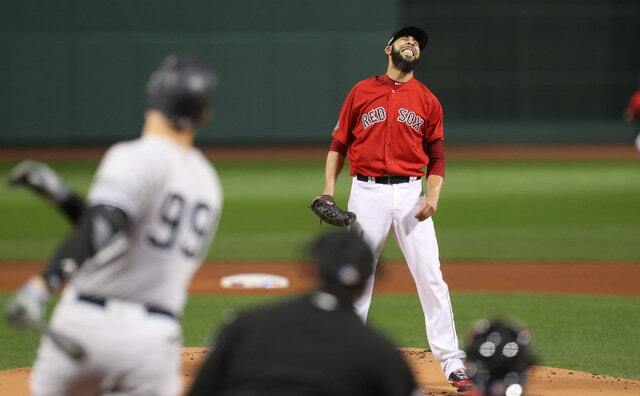 It is David Price’s entire career against the Yankees in one photo. Statcast had the exit velocity at 100.8 mph and the projected distance at 355 feet. That’s a home run in pretty much every other ballpark in the big leagues. Instead, it was a one-run single. Blah. Price got the hook after that. Judge smoked a line drive right at Mookie Betts for the third out of the inning with runners on the corners. Statcast had the hit probability at 82% based on the exit velocity and launch angle. Betts barely had to move. Lame. Price’s line: 1.2 IP, 3 H, 3 R, 3 ER, 2 BB, 0 K, 2 HR on 42 pitches. Between the regular season and the postseason, this was the 299th start of Price’s undeniably excellent career. It was his first career start with zero strikeouts. Crazy. Also, Price is up to a 5.28 ERA in 75 career postseason innings. And just when I thought this night couldn’t get any better, I saw that Price told Pete Abraham he’ll be available for Game Three on Monday. Sweet! 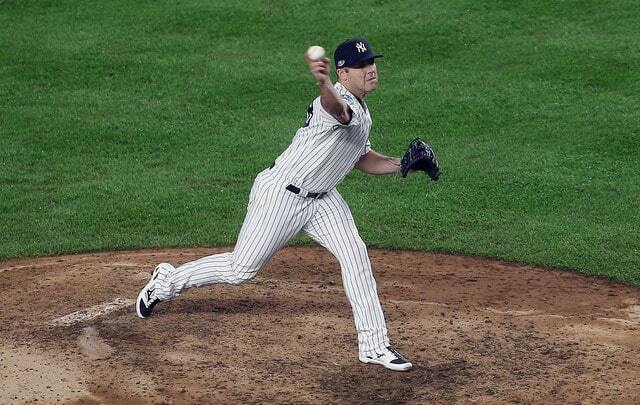 Okay, masterful is probably pushing it, but Masahiro Tanaka was very good Saturday night. He gave up the #obligatoryhomer to Xander Bogaerts on an ambushed first pitch fastball in the fourth inning, but it was only a solo shot, so not a huge deal. 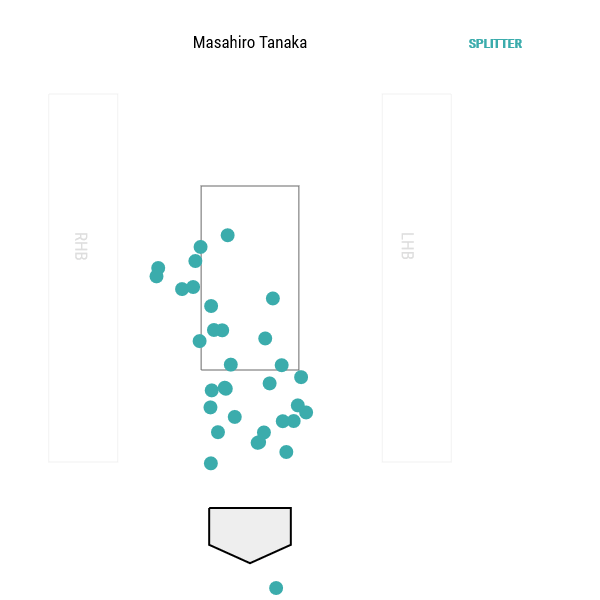 Tanaka retired ten of the first dozen batters he faced before the home run, allowing only a pair of ground ball singles. He then retired five of the six batters he faced after the home run. Tanaka is the most extreme anti-fastball pitcher in baseball. It’s no secret. He threw only 30.9% fastballs during the regular season. The next lowest was Lance McCullers Jr. at 37.2%. Ross Stripling was the only other guy under 40%. He threw 39.6% fastballs. Yeah, Tanaka’s an anti-fastball guy. On Saturday night, he threw 18 fastballs (!) among his 78 pitches, or 23.1%. Geez. It makes sense though. Use the hell out of that splitter and slider. Yup. Two-run lead in a postseason game at Fenway Park with that bullpen behind him? Get Tanaka out of there. Boone did let him face Betts a third time with two outs and the bases empty in the fifth, and he hit a 105 mph line drive to Gardner in center field. Ominous. Good work by Tanaka and good job by Boone getting him out of there when he did. In Game One, the Yankees were all over the Red Sox bullpen. Five relievers faced 19 batters and eight reached base. The Yankees had plenty of opportunities but didn’t get that one big hit. Game Two was kinda the opposite. 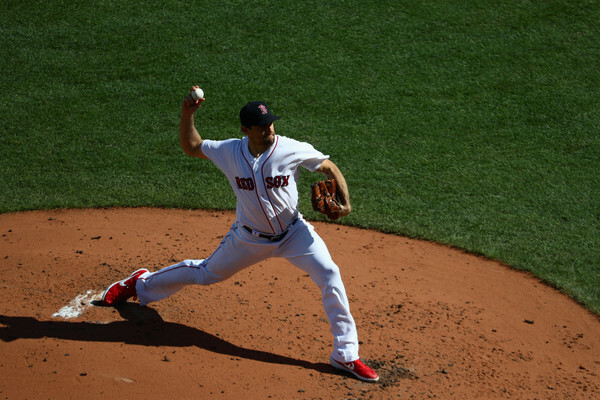 After Price was out of the game, Joe Kelly settled things down with 2.1 scoreless innings. Pretty annoying. Felt like a “they’re going to regret not adding runs” game. Sanchez’s three-run home run against Eduardo Rodriguez stretched the lead to 6-1 and gave the Yankees some much-needed breathing room. They left seven men on base from innings two through six and gosh did it feel like the Yankees were going to regret that. Sanchez wiped that all away. He is 6-for-23 (.261) with four home runs in his last seven games. The at-bats are getting better and the contact is getting louder. I’m not sayin’. I’m just sayin’. With the Yankees still nursing a 3-1 lead, Boone went to Dellin Betances in the sixth inning, and he cut through the 2-3-4 hitters on nine pitches. No strikeouts, but three ground balls. Those work just as well. Betances went out for a second inning after the Sanchez homer and did allow the run in the seventh on a Mitch Moreland single and an Ian Kinsler double. McCutchen’s inexperience playing left field in Fenway Park played a role there. The ball bounced off the wall and over his head. Dellin limited the damage to one run in the seventh and Zach Britton got through eighth without an issue. Aroldis Chapman, who has had a lot of trouble against the Red Sox the last few years, walked the first hitter in the ninth. Argh. Fortunately a strikeout and a game-ending double play ball followed. Hooray. Literally the first ground ball double play Chapman has generated all year. Good timing, eh? Three runs in 15 innings for the bullpen through three postseason games. That’ll work, gentlemen. Sanchez was obviously the star of the show at the plate. He went 2-for-5 with the two home runs and is the third Yankees with a two-homer game against the Red Sox in the postseason. Jason Giambi did it in 2003 ALCS Game Seven and Hideki Matsui did it in 2004 ALCS Game Three. Folks, this is why you start Sanchez in the postseason. He can change a game with one swing and he did it twice Saturday. Also, zero passed balls or wild pitches through three postseason games. Go Gary. So, you think Judge’s wrist is feeling strong? He went 2-for-4 with a homer, an infield single, and a walk. Statcast didn’t pick up the infield single, but the exit velocities on his other three balls in play: 113.3 mph, 109.8 mph, 109.3 mph. A partial list of players who did not have three 109 mph batted balls all regular season: Anthony Rendon, Freddie Freeman, Jose Ramirez, and Matt Carpenter. Judge had three in five innings Saturday. Swoon. Beyond Judge and Sanchez, the Yankees also got hits from McCutchen, Giancarlo Stanton, Miguel Andujar, and Torres. Gardner went 0-for-2 with two walks as the fill-in center fielder. Gardi B saw 28 pitches in his four at-bats and helped set up McCutchen’s run-scoring with a left-on-left walk against Price. He also ran down everything in center. Go Brett. Game Three back in the Bronx. The Yankees and Red Sox have a travel day Sunday before reconvening at Yankee Stadium for Game Three on Monday night. Luis Severino will be on the mound for the Yankees. It’ll be either Rick Porcello or Nathan Eovaldi for the Red Sox. Porcello’s relief appearance in Game One changed Boston’s pitching plans a bit. Game Three is a 7:40pm ET start. If it were May or June or July, it would be easy to chalk up last night’s loss as just one of those games. The starting pitcher had a bad night, the offense had chances but didn’t cash in, blah blah blah. Run of the mill loss. But, because it is October, that one really stings. Despite the early 5-0 deficit, that game was very winnable. The middle of the Red Sox bullpen did everything they could to give that game away and the Yankees said nah, we’re good. So now the Yankees are down one game to none in the best-of-five ALDS. Fun fact: This is the eighth time the Yankees have lost Game One of the ALDS. They came back to win six of the previous seven series, including last year. The one exception is the 2007 ALDS against the Indians. The midge series. The Yankees, including this very group of players, know what it takes to erase a one game deficit in the best-of-five series. They did it last year. They have to do it again this year. Another cool and clear night in Boston. Good weather these first two games. First pitch is scheduled for 8:15pm ET (ugh) and you can watch on TBS and TBS.com. Enjoy the game, everyone. Injury Update: Aaron Hicks (hamstring) went for an MRI this morning and it came back clean. There’s no strain. He still has some tightness but is available tonight. Thank goodness. Hopefully he’ll be back in the starting lineup for Game Three on Monday. Once again, the Yankees are down one game to none in a postseason series. They dropped Game One of the ALDS last night and they’ve now lost Game One in their last four postseason series. Look at the bright side: J.A. Happ didn’t make it out of the third inning, Chris Sale looked about as good as anyone could’ve reasonably expected him to look after his shaky September, the Yankees blew two bases loaded opportunities, Giancarlo Stanton stunk, and the Red Sox still only barely held on. This series is far from over. Here are some thoughts. 1. The Aaron Hicks injury is potentially very bad news. He left last night’s game with a tight hamstring and is going for an MRI today. It’s not the hamstring that caused him to miss the final three games of the series in Tampa last week. It’s the other hamstring. Hicks said he thinks it’s just a cramp and he’s hopeful he can play today, but a hamstring tight enough to require an MRI usually doesn’t land a player back in the lineup the next day. Maybe the Yankees will catch a break and it will truly be nothing more than a cramp, and Hicks can play tonight. Or at least return to the lineup Monday following tomorrow’s travel day. That’d be okay. If the injury is serious enough that the Yankees have to replace Hicks on the roster, he would be ineligible to play in the ALCS. (I guess Tyler Wade would replace him?) The larger problem is not having Hicks. He’s really good! He had by far the best at-bats against Chris Sale last night (six-pitch walk and eleven-pitch single) and he’s a switch-hitter with power and on-base ability. Plus he plays very good defense and runs the bases well. Hicks brings a lot to the table. I love Brett Gardner, he’s forever cool with me, but the drop off from Hicks to Gardner is pretty huge right now. Hopefully today’s MRI brings good news. 2. So, Luke Voit. He had that triple in the Wild Card Game and then had two hard-hit singles last night. I keep waiting for the other shoe to drop and it just isn’t happening. Voit will swing through premium fastballs from right-handers, though he’s hardly alone there, plus his at-bats tend to be very good. He works the count, spoils good pitches, and hits the ball hard more often than not. I don’t know about you, but right now, Voit is absolutely someone I want at the plate in an important situation. I think I’d slide him into the No. 3 lineup spot should Hicks miss time. I know the Yankees like to split up the two big righties in Aaron Judge and Stanton, but can they just stack the best hitters together regardless of handedness? Pretty please? Could be cool. Voit looks more and more legit by the day. I know he turns 28 in February and I know the righty hitting/righty throwing first base profile is historically awful, but look what this dude is doing. It’s good at-bat after good at-bat with plenty of good results. 3. Against the Athletics, using Chad Green as the mid-inning fireman would’ve made perfect sense. He wasn’t needed in the Wild Card Game, but the A’s struggled against good fastballs this year, and Green has a great fastball. The Red Sox crush fastballs. They’re pretty much the exact opposite of the A’s. Green inherited runners on the corners with no outs last night and gave up three very loud batted balls (102.4 mph, 106.5 mph, 101.9 mph) to score both runners. Going forward the rest of the series, the Yankees are probably better off going to someone who can miss bats — or at least miss the barrel — with something that moves when they need to escape a jam. Asking Green to throw fastballs by the Red Sox isn’t a great idea. David Robertson or Dellin Betances or even Jonathan Holder may be a better bet in that mid-inning fireman role the rest of the series. That isn’t to say Green shouldn’t be used at all. He obviously should. But have him start an inning fresh. Let someone else clean up the messes. 4. The Yankees have to take their scouting report on Steve Pearce and throw it right in the trash. How many times in one season can you let a guy beat you? Pearce does way more damage against fastballs (.438 xwOBA) than non-fastballs (.328 xwOBA), and, last night, he saw eight fastballs and four non-fastballs. Dude. Come on. That first inning walk was terrible. J.A. Happ pitched Pearce like he’s Barry Bonds. Four fastballs nowhere particularly close to the zone for an easy walk, with a man on base and J.D. Martinez looming on deck to boot. The Yankees have to do better than this. Pearce is a good hitter. He’s not this good. 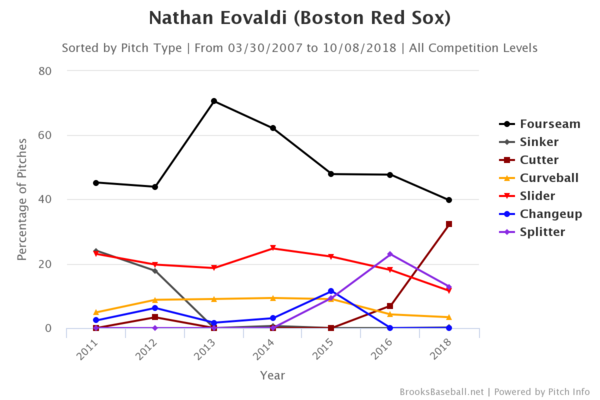 The Red Sox have enough really good hitters as it is. Letting a secondary guy like Pearce draw a crucial walk and single in another run is how postseason series are lost. Hopefully he’s out of the lineup against the two righties in Games Two and Three, because the Yankees sure as heck haven’t figured out how to get him out yet. 5. 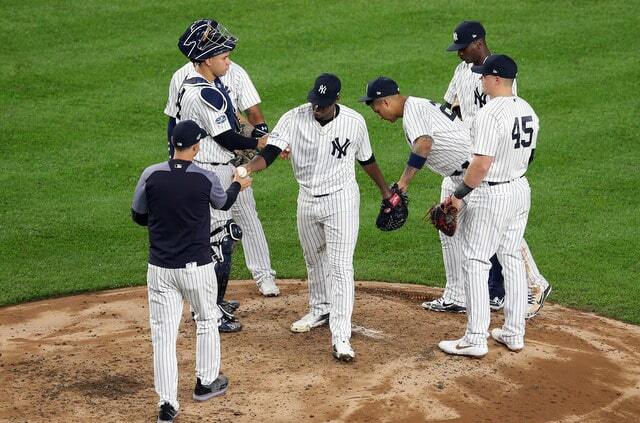 Needless to say, the Yankees really need a good start from Masahiro Tanaka tonight. 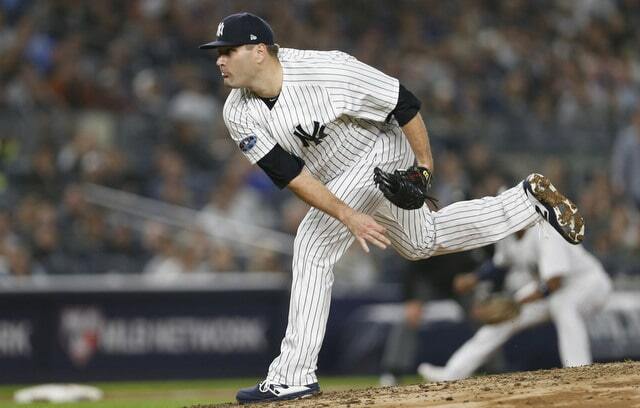 Happ stunk yesterday — that was really, really disappointing — and even though the bullpen is in pretty good shape tonight, it would be nice to see Tanaka get the Yankees through at least five innings. Tanaka hasn’t pitched since last Wednesday, so he’s very well rested. And we know that, when he’s on, he can dominate any lineup. We’ve seen him pitch well against great offenses in the postseason with the team’s back up against the wall. We know he can do it. The Yankees need him to do it again. Two games into the postseason, the Yankees have gotten six innings from their starters and 12 from their bullpen. I expect the bullpen to throw more innings than the rotation overall this postseason. I’m not sure a 2-to-1 ratio is sustainable though. However it happens, the Yankees need a win tonight. A strong outing from Tanaka would be preferable. 6. I did’t run a thoughts post before the series and I never got a chance to make a prediction. My Wild Card Game prediction was okay. I called the Yankees winning and I called Voit getting a two-run extra-base hit in the sixth inning. The rest of it wasn’t so good. Anyway, I’m going to make my ALCS prediction here, because better late than never. I have the Yankees in five, and no, this is not a reaction to last night. I called Yankees in five at CBS before the series. I’ve got the Yankees in five with each closer blowing a game at some point. Miguel Andujar went 0-for-3 with a walk last night but he’s going to have a big series when it’s all said and done. No fewer than four extra-base hits will make him the ALDS MVP, which doesn’t really exist, but you know what I mean. There you have it. The Yankees are winning three of the next four games.